This photographic detail of the face of Padmasambhava was taken in the Jokhang Temple in Lhasa, Tibet's most sacred temple. This large statue stands in the Jokhang's central chapel and is lavishly adorned with gold and jewelled ornaments. 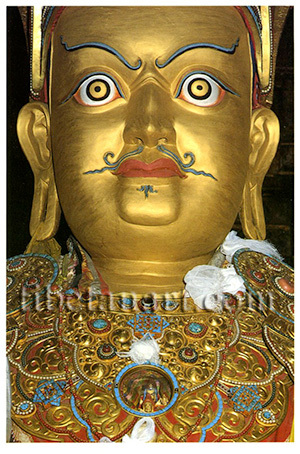 Padmasambhava's gilded face has a slightly wrathful expression, with two wide and staring eyes, raised eyebrows, and the stylized moustache of an Indian tantric master or mahasiddha. A large pair of earrings, studded with turquoise, coral and pearls hang from his ears, and the scrolled design of his copper breast adornment is similarly studded with jewels. At the position of his heart is a glass-fronted reliquary-chamber, which contains various sacred relics and 'self-manifesting' images. The small pieces of white cloth that can be seen on the photograph are silk or cotton offering scarves (khata), which have been thrown onto the image by pilgrims.